With the Windsurf Foil Mach 1 you get the perfect tool for performance freeride and freerace foiling, while having tons of fun and improving day by day. 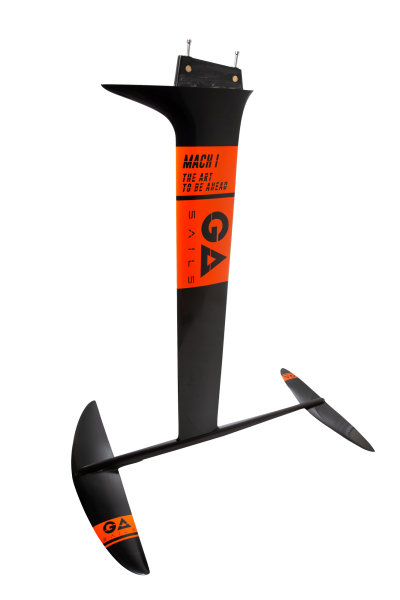 Everybody looking for a high-performance foil will admire the Windsurf Foil Mach 1 with its great speed potential, control and feeling in maneuvers. Our test team was absolutely amazed after their first test runs with the final version of the Windsurf Foil Mach 1 with its extremely light 91cm carbon mast. It takes off strikingly early and without needing too much power in the sail, which allows you to make use of the sensational performance of the foil in even lower winds. The Windsurf Foil Mach 1 reaches impressive top speeds with great control in lower and higher speed, but also in maneuvers and when taking off. You can perfect your foiling jibes, but also go for speed runs, as the foil glides smoothly and in full control at all times. This controllability of the Windsurf Foil Mach 1 allows you to go for a cruise, but soon you will crave for speed, acceleration and foiling jibes on our high-performance freeride foil and the Mach 1 won’t let you down. Kapcsolódó linkek "Mach 1 windfoil"
Vásárlói értékelés "Mach 1 windfoil"